Project Based Learning (PBL) is an inquiry approach to education. An important differentiation of PBL from other pedagogies is the use of a project as the central context for student learning. Traditionally projects have been used near the end of a unit to allow students to summarize or demonstrate their learning; in PBL, projects are the unit, the avenue by which teachers and students construct the learning environment and experience. A key aspect of the project is the intentional inclusion of authenticity in all aspects of the project (the question/problem to solve, the tools used to research, the construction and sharing of learning, and the experts and audience who help build the project). PBL is often selected as a pedagogy first because of its dynamic and engaging approach to learning and second because “PBL has the potential to ‘cover curriculum’ while promoting more in-depth exploration.” Throughout the scope of projects, there is need for guidance and planning to ensure student success in both skills and curricular expectations. The Academy Model of PBL provides the structure and the support needed for student learning. As more schools begin to adopt and use PBL, The Christian Teachers Academy (The Academy) has crafted its own model of how good Project Based Learning should be organized. The included graphic shows the elements of The Academy Model of PBL. These elements are woven together as they need to be understood within the context of the whole model. 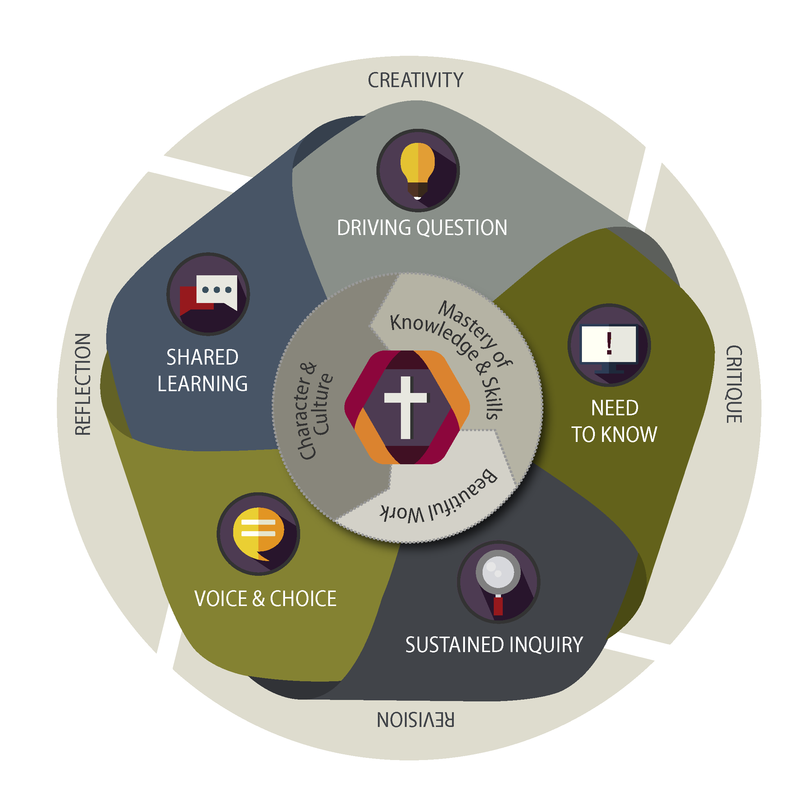 The central elements are the core aspects of a Christian school's identity. Christian schools confess that the life of Jesus Christ is the embodiment of wisdom. Our own lives, and indeed all of creation, are redeemed and restored through him. Our pursuit of the three dimensions of learning we desire for all students — Culture and Character, Mastery of Knowledge and Skills, and Beautiful Work — are centred in him. All learners, as image-bearers of Christ, are discovering creation and are deepening their stewardship of it. “We inherit knowledge and skills from the ongoing story of creation and humanity and communally discern how to use knowledge and skills in service to God and his kingdom.” The context for a Mastery of Knowledge and Skills is found within the selected school curriculum and desired learning skills or learning habits. Mastery of Knowledge and Skills is best achieved within a PBL framework that provides an authentic learning environment. Teachers, parents, and community members all wish to see students create Beautiful Work that demonstrates purpose, pride, and craftsmanship of learning. Students generally want to produce the best novel, poem, drawing, movie, presentation, or other product that represents their learning; an authentic purpose for the work encourages beauty and quality. Creating Beautiful Work takes time and effort. Beautiful Work is created through the use of previous student learning models (exemplars), a willingness to accept feedback and critique, and then the application of that feedback to refine the work through multiple drafts. Built on the work of the Buck Institute, the following elements are essential for effective project design. Although they can be described on their own, they overlap and complement each other in the dynamic path of a project and are held together in The Core: the central elements of the design. This element specifies the inquiry segment of the project that explores responses to the Driving Question. The Need to Know can be approached from both the teacher's and the students' point of view. As learning guides, teachers ensure that important curricular expectations are integrated into the project design. Ideally these core knowledge and skills — specific skill sets, certain tools and resources, curricular content, or concepts — are also identified as necessary to know by the students as they enter more deeply into the inquiry of the project, and the purpose of the project encourages students to commit to the time required for mastery to occur. Sustained Inquiry is both a deep and repeated process that needs to be included in more than just the research phase of a project. Students need to develop and enter into an inquiry mindset for the entire path of the project. Inquiry becomes a sustained cycle: students are constantly questioning and evaluating information to help answer the driving question. We recognize that teachers have authority in the classroom and in managing student learning. However, we also recognize that learning must be relevant to the student. Voice and Choice needs to be more than letting students choose their product or topic; this is indeed one aspect, but teachers also need to “give students space to make decisions around teamwork, tasks, and the inquiry process.” When students are given the freedom to make such decisions, they often develop a sense of pride and ownership in their learning. A key aspect to Project Based Learning is authenticity. When students know they will be sharing their learning with others, their work needs to be relevant for themselves and the intended audience. Therefore, the need for Shared Learning throughout the project is important to its overall success and as a means to receive feedback in order to shape the project. Incorporating other cultural experts and audiences beyond just the teacher and classmates provides students an opportunity to share their learning throughout the project and become more adept at communicating meaningfully. A complexity of the Learning Habits is that they are not independent of each other and are often co-developed. A challenge in developing these habits is providing the time and structures required for students to practice them and assessing/monitoring student progress. Creativity is a necessary habit in all Project Based Learning elements — design of the question, organization of research and findings, development of learning product, selection of tools, etc. Creativity stems from developing the Character and Culture of learning communities. A “Fail Fast to make Beautiful Work” motto would encourage risk-taking and innovation as learners move from ideas to action in furthers drafts of their work. This is not viewed as a negative; rather, it is a formative stage of learning that encourages ownership of the project. A project that values Creativity often encourages a sense of play and flow for students and teachers. Learning growth occurs through clarity in the learning targets and a shared culture of timely, learner-friendly, and ongoing critique and feedback. In PBL, all participants are responsible for each other’s growth. The challenge of the teacher is to create a culture and to build the structures that foster kind, helpful, and specific feedback. There are many protocols that can be employed at various stages of the project to help focus the critique and develop ideas into Beautiful Work. A culture of healthy critique and student engagement will foster Revision. Growth is a mindset, but it can also be tracked through the revision process. These iterations of learning and the feedback received contribute to the metacognitive growth of the learner. This is a habit that needs to be practiced throughout the project and needs to be undertaken with others such as peers, teachers, and community members. Reflection and Revision are often linked together in many learning models with Reflection being the last celebratory piece of learning. Reflection, when used throughout a project, has the potential to impact a project for both students and teachers. Intentionally setting aside time for students to document their learning provides an opportunity to check for Assessment and Learning. These Reflections can then be built into a Portfolio or Summary of Learning.